The occupied canonical orbitals that are obtained from a Hartree-Fock (HF) calculation are generally delocalized. 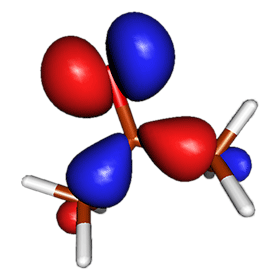 In many situations, this is undesirable because it is difficult to attach a chemical interpretation to these molecular orbitals. However, the set of canonical molecular orbitals can be transformed into equally valid set of localized HF molecular orbitals by a (unitary) transformation that preserves orthonormality. These localized molecular orbitals (LMOs) correspond to chemically familiar concepts including the core orbitals on the heavy atoms, bond orbitals, and the lone pair orbitals. The latter can be either sp hybrids or σ and π orbitals. The pair of images below illustrates the canonical (left) and natural (left) highest occupied molecular orbital (HOMO) for acetone. The localization is usually carried out as part of a so-called Natural Bond Orbital (NBO) analysis. Natural Bond Orbitals can be obtained by diagonalization of localized blocks of the density matrix. They correspond to the Lewis structure representation of the molecule describing "localized electrons" in bonds and lone pairs. 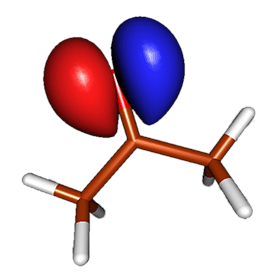 For example, notice that the HOMO of acetone can be clearly interpreted as the orbital holding one of the lone pairs. If resonance is important the molecule cannot be represented by a single Lewis structure and the NBO analysis has to be extended to include combinations of the relevant NBOs to form Natural Localized Molecular Orbitals (NLMOs). The Gaussian computer code automatically makes this extension. However, for molecules where there is no significant resonance, the NLMOs and NBOs are essentially the same. For example, the NLMOs of methane consist of one carbon core orbital and four equivalent sp3 hybrid C-H bond orbitals. The wavefunction has an RHF -> UHF instability. Notice that the occupied MO coefficients correspond to an orbital that is delocalized over both H atoms whereas we know that, at long internuclear distances there should be one electron localized on each H atom. If the RHF wavefunction is unstable, a lower energy solution may be found by invoking the calculation with the Stable=Opt keyword. If instability is found the RHF wavefunction is allowed to become UHF. Molecular hydrogen is a simple case because it has the same symmetry at all internuclear distances. For an arbitrary molecule the program will also check for instability with respect to reducing molecular symmetry. Reduce DIIS space if new energy is above lowest so far. Dynamic level shift is off after energy rises. Keep R1 and R2 integrals in memory in canonical form, NReq=      818934. Notice that now the MO coefficients show a physically correct behavior. You can retrieve the correct MO coefficient into a new file using the Guess=(Read,Only) keyword.